Core 7 is the compact model in this range of high-end professional reference monitor systems. This no-compromise two-way design features two class-D amplifiers (one for 500W amp for the mid/woofer and a 150W unit for the tweeter), plus the best of modern DSP technology and a flat bass response down into to 44Hz with -6dB at 38Hz. It's been specifically designed and engineered to meet the challenges of high-demand environments that recording engineers, mixers, producers and editors work in all day, every day. Each driver unit is handmade at the factory in Denmark. And because we produce 1.4 million drivers each year for the home hi-fi, custom-install, in-car and pro-studio markets, they can ensure extreme consistency. That makes it possible to use Core monitors in multiple studios and have them all sound and perform at the same high level – giving you everything you need to hear, everywhere you use them. Known for their soft-dome tweeters, they provide hours of pinpoint imaging and detail without the listener fatigue common to other designs. Core 7 builds on this heritage with the brand-new Esotar Pro tweeter – the latest breakthrough in their engineers’ obsessive attention to driver detail. New advanced manufacturing techniques and their astonishing Jupiter testing facility, have let their designers take tweeter design to a new level with the revolutionary Hexis system. Hexis optimises airflow, smooths frequency response and eliminates unwanted internal resonances. The result? Jaw-dropping imaging and transient detail, and effortless high-frequency response. But they weren’t happy to leave it there: Core 7’s mid/woofer driver is another leap forward. Taking their proprietary MSP (Magnesium Silicate Polymer) cone material along with aluminium voice coils, glass-fibre formers and advanced magnet designs to produce drivers capable of the kind of accuracy and honesty you’d never thought possible. MSP provides the best combination of lightness, stiffness and damping – making it capable of producing deep, accurate bass while also delivering natural midrange detail, all in one driver for the best imaging and point-source delivery. 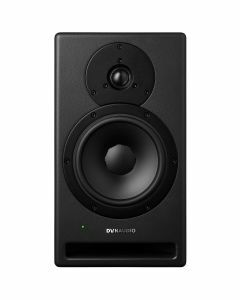 The active Dynaudio AIR series was famous for its advanced digital signal processing. Their acoustic engineers continued this forward-thinking approach by taking the past 18 years’ worth of DSP innovation and applying it in a simple, easy to use system with the Core series. Make no mistake, though: under the hood is a sophisticated system that makes light work of challenging studio environments. Positioning is critical when installing a monitor system. That’s why each Core 7 has two DSP filter switches to address its position and boundary locations. For example, if you place the monitors on the meter bridge of a large-format mixing console, set them to ‘Desk’. This will help compensate for the first reflection created by the mixing surface. On the other hand, if you put the monitors into a purpose-built wall, setting the Position 1 filter to ‘Soffit’ will compensate for the increased bass response. Boundary effects created by placing a monitor close to walls or a ceiling can be compensated for by adjusting the Position 2 filter between ‘Wall’ or ‘Corner’. These filters help compensate for the reflections created by the boundary walls, especially in the lower frequencies. There’s also a low-frequency 80Hz Linkwitz-Riley cutoff that can be engaged if you’re using Core 7 with a subwoofer to extend the low frequency response. The noise-floor and signal resolution of any monitoring system is critical to its performance. Whether you’re using the analogue or digital inputs, you need to be able to control the gain staging between the monitor controller and the speaker system. We’ve provided a range of 0dBu to +24dBu to match the analogue input sensitivity to the output level. Once optimised, Core 7 processes all analogue signals at a 192kHz sampling rate and 64-bit resolution in the DSP (from the 24-bit analogue-to-digital converter) for the greatest degree of mathematical precision. There’s a switch to determine the maximum output SPL with the greatest bit-depth in the DSP. If you want the maximum level, set this to 112dB. If you work mostly at lower levels, choose a lower SPL setting to optimise the bit-depth of the DSP for both inputs. When using the AES digital inputs, you must determine which channel (left or right) of the AES stream is used for that monitor. Core 7’s DSP operates at the incoming sample rate and either locks to the digital audio clock or word clock to maintain the most accurate signal possible. Dynaudio have made sure Core 7’s cabinet is as stiff and inert as we could make it – hence the 32mm thick baffle, which contributes to its excellent linearity across the spectrum. Since every application is unique and monitors need to be placed in a variety of environments – either on their sides, vertically or sometimes even inverted with the woofer above the tweeter – we’ve designed Core 7 with indentations on all four sides. We’ve even developed special pads that can be placed in order to protect the cabinet's finish and stabilise the cabinet on the surface. That goes for multi-channel set-ups, too: we also have custom K&M brackets to mount Core 7 in orientations suitable for surround sound, immersive audio (such as Dolby ATMOS) and other custom configurations. Stop second-guessing. Core delivers everything you need to hear. Each driver has its own dedicated Pascal Class-D ampli er: 500 W woofer and a 150 W amp for the tweeter.